Dmitry Kaminker was born in 1949 in Leningrad. From 1969 until 1973 he studied at the Mukhina Art College in the Architectural and Decorative Sculpture Department. 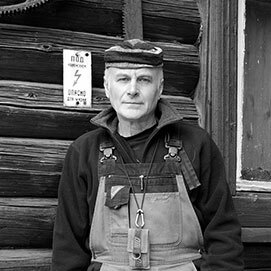 Dmitry Kaminker is the creative leader of the “Shuvalovo-Ozerki” group of artists and a founding member of the KruKaKo sculptural international alliance. From 1980 he is a member of the Russian Union of Artists. In 1994-1999 he served as a committee member for the Presidential National Art Prize. In 1993 he was N.Punin Prize-winner of Art Critics of Saint-Petersburg. In 2005 he won Diaghilev Art Prize (St. Petersburg) and also became a laureate of the International Art Festival “Master-class” St. Petersburg in 2007. Now he is a permanent participant of project "Artist's village", St. Petersburg, Russia. Dmitry Kaminker is an acknowledged master, the bearer of deep cultural traditions. He uses classical method of three-dimensional thinking together with new awareness of the form.